The School of Health Sciences has signed up for the Unicef UK Baby Friendly Initiative (BFI) to support and sustain breastfeeding rates in the UK. Implementing the Unicef BFI standards across the BSc and PGDip Public Health (Health Visiting) programme, it will equipping student health visitors with knowledge, skills and attitudes to support breastfeeding at point of getting their award and their professional registration. 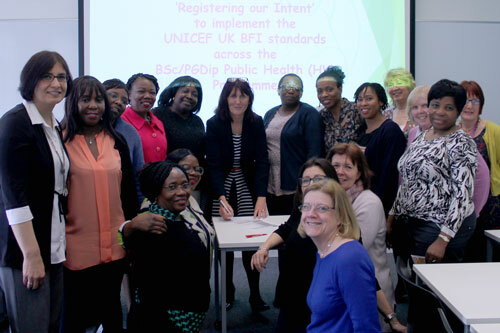 The signing of the BFI Registration of Intent was undertaken by Professor Debra Salmon, Deputy Dean of the School of Health Sciences, at an event on Friday 22nd April. The initiative will also help contribute to the health and wellbeing of future generations as well as complimenting the sustainability agenda at City. Despite the overwhelming health benefits at individual and public health level a recent report in The Lancet has revealed that the UK has the lowest breastfeeding rate of infants at 1 year old in the world. The study revealed that only one in 200 women - or 0.5% - are still doing any degree of breastfeeding after a year. This compares with 23% in Germany, 56% in Brazil and 99% in Senegal. The economic, environmental and public health consequences of improving breastfeeding rates are significant. As in 2012, Unicef reported that moderate increases in breastfeeding rates could save the NHS millions with the recent Lancet report placing the savings even higher in the order of billions. In addition, in the UK poorer mothers are far less likely to breastfeed than richer mothers, which increases health and social inequality, and therefore mothers need more support and protection when it comes to breastfeeding. “The breastfeeding crisis in the UK is due to a lack of support for those mothers who choose to breastfeed. Debating choice to breastfeed brings very emotive reactions but these poor rates of breastfeeding should not be seen as the responsibility of individual mothers, but as a result of our the fact that we are primarily a bottle-feeding culture and the milk manufacturing industry is worth billions. Successive Governments have also failed to control its influence on women's choices.